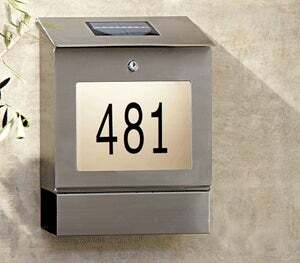 The obviously named Solar House Number Display & Mailbox will not only help guests find your home in the dark, but it keeps your mail and newspaper snug, too. The box drinks in solar rays during the day, and when evening comes, it automatically triggers the LED backlighting, lasting for up to 10 hours. Just use the numbers provided in the package to indicate your house number, mount the thing up, and forget about it–no batteries, and it's water resistant. Worried about someone walking up and snagging your mail? The mailbox has a lock, though the newspaper just slides into the cubby at the bottom of the unit. Good luck trying to get the paperboy to walk up and slide your newspaper in just for you. The Solar House Number Display & Mailbox costs $128.